For other uses, see Viking (disambiguation). Vikings (Old English: wicing—"pirate", Danish and Bokmål: vikinger; Swedish and Nynorsk: vikingar; Icelandic: víkingar, from Old Norse) were Norse seafarers, mainly speaking the Old Norse language, who during the late 8th to late 11th centuries, raided and traded from their Northern European homelands across wide areas of Europe, and explored westwards to Iceland, Greenland, and Vinland. The term is also commonly extended in modern English and other vernaculars to the inhabitants of Norse home communities during what has become known as the Viking Age. 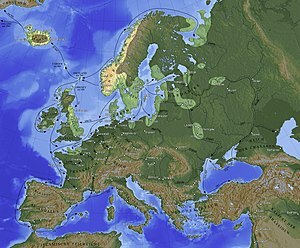 This period of Nordic military, mercantile and demographic expansion constitutes an important element in the early medieval history of Scandinavia, Estonia, the British Isles, France, Kievan Rus' and Sicily. Facilitated by advanced sailing and navigational skills, and characterised by the longship, Viking activities at times also extended into the Mediterranean littoral, North Africa, and the Middle East. Following extended phases of (primarily sea- or river-borne) exploration, expansion and settlement, Viking (Norse) communities and governments were established in diverse areas of north-western Europe, Belarus, Ukraine and European Russia, the North Atlantic islands and as far as the north-eastern coast of North America. This period of expansion witnessed the wider dissemination of Norse culture, while simultaneously introducing strong foreign cultural influences into Scandinavia itself, with profound developmental implications in both directions. Popular, modern conceptions of the Vikings—the term frequently applied casually to their modern descendants and the inhabitants of modern Scandinavia—often strongly differ from the complex picture that emerges from archaeology and historical sources. A romanticised picture of Vikings as noble savages began to emerge in the 18th century; this developed and became widely propagated during the 19th-century Viking revival. Perceived views of the Vikings as alternatively violent, piratical heathens or as intrepid adventurers owe much to conflicting varieties of the modern Viking myth that had taken shape by the early 20th century. Current popular representations of the Vikings are typically based on cultural clichés and stereotypes, complicating modern appreciation of the Viking legacy. These representations are not always accurate — for example, there is no evidence that they wore horned helmets. One etymology derives víking from the feminine vík, meaning "creek, inlet, small bay". 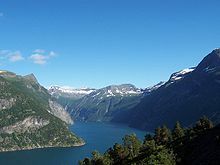 Various theories have been offered that the word viking may be derived from the name of the historical Norwegian district of Viken (or Víkin in Old Norse), meaning "a person from Viken". According to this theory, the word simply described persons from this area, and it is only in the last few centuries that it has taken on the broader sense of early medieval Scandinavians in general. However, there are a few major problems with this theory. People from the Viken area were not called 'Viking' in Old Norse manuscripts, but are referred to as víkverir (Modern Norwegian: vikvær), 'Vík dwellers'. In addition, that explanation could explain only the masculine (Old Scandinavian víkingr) and ignore the feminine (Old Norse víking), which is a serious problem because the masculine is easily derived from the feminine but hardly vice versa. The form also occurs as a personal name on some Swedish runestones. The stone of Tóki víking (Sm 10) was raised in memory of a local man named Tóki who got the name Tóki víking (Toki the viking), presumably because of his activities as a viking. The Gårdstånga Stone (DR 330) uses the phrase "ÞeR drængaR waRu wiða unesiR i wikingu" (These men where well known i viking), referring to the stone's dedicatees as vikings. The Västra Strö 1 Runestone has an inscription in memory of a Björn, who was killed when "i viking". In Sweden there is a locality known since the middle ages as Vikingstad. The Bro Stone (U 617) was risen in memory of Assur who is said to have protected the land from vikings (SaR vaR vikinga vorðr með Gæiti). There is little indication of any negative connotation in the term before the end of the Viking Age. Another etymology, one that gained support in the early twenty-first century, derives Viking from the same root as Old Norse vika, f. 'sea mile', originally 'the distance between two shifts of rowers', from the root *weik or *wîk, as in the Proto-Germanic verb *wîkan, 'to recede'. This is found in the Proto-Nordic verb *wikan, 'to turn', similar to Old Icelandic víkja (ýkva, víkva) 'to move, to turn', with well-attested nautical usages. Linguistically, this theory is better attested, and the term most likely predates the use of the sail by the Germanic peoples of North-Western Europe, because the Old Frisian spelling shows that the word was pronounced with a palatal k and thus in all probability existed in North-Western Germanic before that palatalisation happened, that is, in the 5th century or before (in the western branch). In that case, the idea behind it seems to be that the tired rower moves aside for the rested rower on the thwart when he relieves him. The Old Norse feminine víking (as in the phrase fara í víking) may originally have been a sea journey characterised by the shifting of rowers, i.e. a long-distance sea journey, because in the pre-sail era, the shifting of rowers would distinguish long-distance sea journeys. A víkingr (the masculine) would then originally have been a participant on a sea journey characterised by the shifting of rowers. In that case, the word Viking was not originally connected to Scandinavian seafarers but assumed this meaning when the Scandinavians begun to dominate the seas. In Old English, the word wicing appears first in the Anglo-Saxon poem, Widsith, which probably dates from the 9th century. In Old English, and in the history of the archbishops of Hamburg-Bremen written by Adam of Bremen in about 1070, the term generally referred to Scandinavian pirates or raiders. As in the Old Norse usages, the term is not employed as a name for any people or culture in general. The word does not occur in any preserved Middle English texts. One theory made by the Icelander Örnolfur Kristjansson is that the key to the origins of the word is "wicinga cynn" in Widsith, referring to the people or the race living in Jórvík (York, in the ninth century under control by Norsemen), Jór-Wicings. The word Viking was introduced into Modern English during the 18th-century Viking revival, at which point it acquired romanticised heroic overtones of "barbarian warrior" or noble savage. During the 20th century, the meaning of the term was expanded to refer to not only seaborne raiders from Scandinavia and other places settled by them (like Iceland and the Faroe Islands), but also any member of the culture that produced said raiders during the period from the late 8th to the mid-11th centuries, or more loosely from about 700 to as late as about 1100. As an adjective, the word is used to refer to ideas, phenomena, or artefacts connected with those people and their cultural life, producing expressions like Viking age, Viking culture, Viking art, Viking religion, Viking ship and so on. 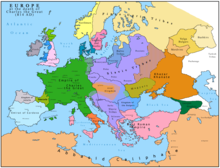 Europe in 814. Roslagen is located along the coast of the northern tip of the pink area marked "Swedes and Goths". The Vikings were known as Ascomanni ("ashmen") by the Germans for the ash wood of their boats, Dubgail and Finngail ( "dark and fair foreigners") by the Irish, Lochlannach ("lake person") by the Gaels and Dene (Dane) by the Anglo-Saxons. The Slavs, the Arabs and the Byzantines knew them as the Rus' or Rhōs, probably derived from various uses of rōþs-, "related to rowing", or derived from the area of Roslagen in east-central Sweden, where most of the Vikings who visited the Slavic lands came from. Some archaeologists and historians of today believe that these Scandinavian settlements in the Slavic lands played a significant role in the formation of the Kievan Rus' federation, and hence the names and early states of Russia and Belarus. The modern day name for Sweden in several neighbouring countries is possibly derived from rōþs-, Rootsi in Estonian and Ruotsi in Finnish. The Slavs and the Byzantines also called them Varangians (Russian: варяги, from Old Norse Væringjar, meaning 'sworn men', from vàr- "confidence, vow of fealty", related to Old English wær "agreement, treaty, promise", Old High German wara "faithfulness"). Scandinavian bodyguards of the Byzantine emperors were known as the Varangian Guard. The Franks normally called them Northmen or Danes, while for the English they were generally known as Danes or heathen and the Irish knew them as pagans or gentiles. Anglo-Scandinavian is an academic term referring to the people, and archaeological and historical periods during the 8th to 13th centuries in which there was migration to—and occupation of—the British Isles by Scandinavian peoples generally known in English as Vikings. It is used in distinction from Anglo-Saxon. Similar terms exist for other areas, such as Hiberno-Norse for Ireland and Scotland. The period from the earliest recorded raids in the 790s until the Norman conquest of England in 1066 is commonly known as the Viking Age of Scandinavian history. Vikings used the Norwegian Sea and Baltic Sea for sea routes to the south. The Normans were descended from Vikings who were given feudal overlordship of areas in northern France—the Duchy of Normandy—in the 10th century. In that respect, descendants of the Vikings continued to have an influence in northern Europe. Likewise, King Harold Godwinson, the last Anglo-Saxon king of England, had Danish ancestors. Two Vikings even ascended to the throne of England, with Sweyn Forkbeard claiming the English throne in 1013–1014 and his son Cnut the Great becoming king of England 1016–1035. Geographically, a Viking Age may be assigned to not only Scandinavian lands (modern Denmark, Norway and Sweden), but also territories under North Germanic dominance, mainly the Danelaw, including Scandinavian York, the administrative centre of the remains of the Kingdom of Northumbria, parts of Mercia, and East Anglia. Viking navigators opened the road to new lands to the north, west and east, resulting in the foundation of independent settlements in the Shetland, Orkney, and Faroe Islands; Iceland; Greenland; and L'Anse aux Meadows, a short-lived settlement in Newfoundland, circa 1000. The Greenland settlement was established around 980, during the Medieval Warm Period, and its demise by the mid-15th century may have been partly due to climate change. The Viking Rurik dynasty took control of territories in Slavic and Finno-Ugric-dominated areas of Eastern Europe; they annexed Kiev in 882 to serve as the capital of the Kievan Rus'. 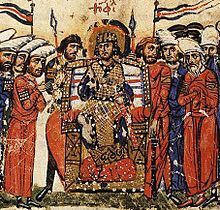 As early as 839, when Swedish emissaries are first known to have visited Byzantium, Scandinavians served as mercenaries in the service of the Byzantine Empire. In the late 10th century, a new unit of the imperial bodyguard formed. Traditionally containing large numbers of Scandinavians, it was known as the Varangian Guard. The word Varangian may have originated in Old Norse, but in Slavic and Greek it could refer either to Scandinavians or Franks. 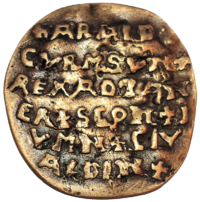 The most eminent Scandinavian to serve in the Varangian Guard was Harald Hardrada, who subsequently established himself as king of Norway (1047–1066). An emperor of the Byzantine Empire is guarded by two Vikings with spear (Varangian Guardsmen). From the Chronicle of John Skylitzes. There is archaeological evidence that Vikings reached Baghdad, the centre of the Islamic Empire. The Norse regularly plied the Volga with their trade goods: furs, tusks, seal fat for boat sealant, and slaves. Important trading ports during the period include Birka, Hedeby, Kaupang, Jorvik, Staraya Ladoga, Novgorod, and Kiev. Generally speaking, the Norwegians expanded to the north and west to places such as Ireland, Scotland, Iceland, and Greenland; the Danes to England and France, settling in the Danelaw (northern/eastern England) and Normandy; and the Swedes to the east, founding Kievan Rus'. Among the Swedish runestones mentioning expeditions overseas, almost half tell of raids and travels to western Europe. According to the Icelandic sagas, many Norwegian Vikings also went to eastern Europe. In the Viking Age, the present day nations of Norway, Sweden and Denmark did not exist, but were largely homogeneous and similar in culture and language, although somewhat distinct geographically. The names of Scandinavian kings are reliably known for only the later part of the Viking Age. After the end of the Viking Age the separate kingdoms gradually acquired distinct identities as nations, which went hand-in-hand with their Christianisation. Thus the end of the Viking Age for the Scandinavians also marks the start of their relatively brief Middle Ages. Colonization of Iceland by Norwegian Vikings began in the ninth century. The first source that Iceland and Greenland appear in is a papal letter of 1053. Twenty years later, they are then seen in the Gesta of Adam of Bremen. It was not until after 1130, when the islands had become Christianized, that accounts of the history of the islands were written from the point of view of the inhabitants in sagas and chronicles. The Vikings explored the northern islands and coasts of the North Atlantic, ventured south to North Africa and east to Russia, Constantinople, and the Middle East. They raided and pillaged, traded, acted as mercenaries and settled wide-ranging colonies. Early Vikings probably returned home after their raids. Later in their history, they began to settle in other lands. Vikings under Leif Ericson, heir to Erik the Red, reached North America and set up short-lived settlements in present-day L'Anse aux Meadows, Newfoundland, Canada. This expansion occurred during the Medieval Warm Period. Viking expansion into continental Europe was limited. Their realm was bordered by powerful cultures to the south. Early on, it was the Saxons, who occupied Old Saxony, located in what is now Northern Germany. The Saxons were a fierce and powerful people and were often in conflict with the Vikings. To counter the Saxon aggression and solidify their own presence, the Danes constructed the huge defence fortification of Danevirke in and around Hedeby. The Vikings soon witnessed the violent subduing of the Saxons by Charlemagne, in the thirty-year Saxon Wars in 772–804. The Saxon defeat resulted in their forced christening and the absorption of Old Saxony into the Carolingian Empire. 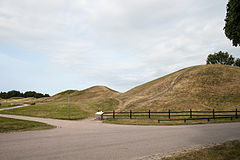 Fear of the Franks led the Vikings to further expand Danevirke, and the defence constructions remained in use throughout the Viking Age and even up until 1864. The south coast of the Baltic Sea was ruled by the Obotrites, a federation of Slavic tribes loyal to the Carolingians and later the Frankish empire. The Vikings—led by King Gudfred—destroyed the Obotrite city of Reric on the southern Baltic coast in 808 AD and transferred the merchants and traders to Hedeby. This secured their supremacy in the Baltic Sea, which remained throughout the Viking Age. The motives driving the Viking expansion are a topic of much debate in Nordic history. One common theory posits that Charlemagne "used force and terror to Christianise all pagans", leading to baptism, conversion or execution, and as a result, Vikings and other pagans resisted and wanted revenge. Professor Rudolf Simek states that "it is not a coincidence if the early Viking activity occurred during the reign of Charlemagne". The penetration of Christianity into Scandinavia led to serious conflict dividing Norway for almost a century. Another explanation is that the Vikings exploited a moment of weakness in the surrounding regions. England suffered from internal divisions and was relatively easy prey given the proximity of many towns to the sea or to navigable rivers. Lack of organised naval opposition throughout Western Europe allowed Viking ships to travel freely, raiding or trading as opportunity permitted. The decline in the profitability of old trade routes could also have played a role. Trade between western Europe and the rest of Eurasia suffered a severe blow when the Roman Empire fell in the 5th century. The expansion of Islam in the 7th century had also affected trade with western Europe. Raids in Europe, including raids and settlements from Scandinavia, were not unprecedented and had occurred long before the Vikings arrived. The Jutes invaded the British Isles three centuries earlier, pouring out from Jutland during the Age of Migrations, before the Danes settled there. The Saxons and the Angles did the same, embarking from mainland Europe. The Viking raids were, however, the first to be documented in writing by eyewitnesses, and they were much larger in scale and frequency than in previous times. Vikings themselves were expanding; although their motives are unclear, historians believe that scarce resources were a factor. The "Highway of Slaves" was a term used to describe a route that the Vikings found to have a direct pathway from Scandinavia to Constantinople and Baghdad while traveling on the Baltic Sea. With the advancements of their ships during the ninth century, the Vikings were able to sail to Russia and some northern parts of Europe. Jomsborg, or Jómsborg (German: Jomsburg), was a semi-legendary Viking stronghold at the southern coast of the Baltic Sea (medieval Wendland, modern Pomerania), that existed between the 960s and 1043. Its inhabitants were known as Jomsvikings. Jomsborg's exact location, or its existence, has not yet been established, though it is often maintained that Jomsborg was somewhere on the islands of the Oder estuary. During the Viking Age, Scandinavian men and women travelled to many parts of Europe and beyond, in a cultural diaspora that left its traces from Newfoundland to Byzantium. This period of energetic activity also had a pronounced effect in the Scandinavian homelands, which were subject to a variety of new influences. In the 300 years from the late 8th century, when contemporary chroniclers first commented on the appearance of Viking raiders, to the end of the 11th century, Scandinavia underwent profound cultural changes. By the late 11th century, royal dynasties legitimised by the Catholic Church (which had had little influence in Scandinavia 300 years earlier) were asserting their power with increasing authority and ambition, and the three kingdoms of Denmark, Norway, and Sweden had taken shape. Towns appeared that functioned as secular and ecclesiastical administrative centres and market sites, and monetary economies began to emerge based on English and German models. 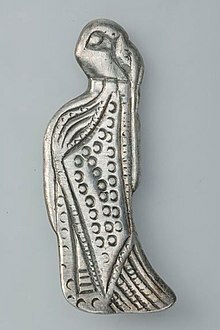 By this time the influx of Islamic silver from the East had been absent for more than a century, and the flow of English silver had come to an end in the mid-11th century. Christianity had taken root in Denmark and Norway with the establishment of dioceses during the 11th century, and the new religion was beginning to organise and assert itself more effectively in Sweden. Foreign churchmen and native elites were energetic in furthering the interests of Christianity, which was now no longer operating only on a missionary footing, and old ideologies and lifestyles were transforming. By 1103, the first archbishopric was founded in Scandinavia, at Lund, Scania, then part of Denmark. The assimilation of the nascent Scandinavian kingdoms into the cultural mainstream of European Christendom altered the aspirations of Scandinavian rulers and of Scandinavians able to travel overseas, and changed their relations with their neighbours. One of the primary sources of profit for the Vikings had been slave-taking. The medieval Church held that Christians should not own fellow Christians as slaves, so chattel slavery diminished as a practice throughout northern Europe. This took much of the economic incentive out of raiding, though sporadic slaving activity continued into the 11th century. Scandinavian predation in Christian lands around the North and Irish Seas diminished markedly. The kings of Norway continued to assert power in parts of northern Britain and Ireland, and raids continued into the 12th century, but the military ambitions of Scandinavian rulers were now directed toward new paths. In 1107, Sigurd I of Norway sailed for the eastern Mediterranean with Norwegian crusaders to fight for the newly established Kingdom of Jerusalem, and Danes and Swedes participated energetically in the Baltic Crusades of the 12th and 13th centuries. A variety of sources illuminate the culture, activities, and beliefs of the Vikings. Although they were generally a non-literate culture that produced no literary legacy, they had an alphabet and described themselves and their world on runestones. Most contemporary literary and written sources on the Vikings come from other cultures that were in contact with them. Since the mid-20th century, archaeological findings have built a more complete and balanced picture of the lives of the Vikings. The archaeological record is particularly rich and varied, providing knowledge of their rural and urban settlement, crafts and production, ships and military equipment, trading networks, as well as their pagan and Christian religious artefacts and practices. One of the few surviving manuscript leaves from the Heimskringla Sagas, written by Snorri Sturluson c. 1260. The leaf tells of King Ólafur. The most important primary sources on the Vikings are contemporary texts from Scandinavia and regions where the Vikings were active. Writing in Latin letters was introduced to Scandinavia with Christianity, so there are few native documentary sources from Scandinavia before the late 11th and early 12th centuries. The Scandinavians did write inscriptions in runes, but these are usually very short and formulaic. Most contemporary documentary sources consist of texts written in Christian and Islamic communities outside Scandinavia, often by authors who had been negatively affected by Viking activity. Later writings on the Vikings and the Viking Age can also be important for understanding them and their culture, although they need to be treated cautiously. After the consolidation of the church and the assimilation of Scandinavia and its colonies into the mainstream of medieval Christian culture in the 11th and 12th centuries, native written sources begin to appear, in Latin and Old Norse. In the Viking colony of Iceland, an extraordinary vernacular literature blossomed in the 12th through 14th centuries, and many traditions connected with the Viking Age were written down for the first time in the Icelandic sagas. A literal interpretation of these medieval prose narratives about the Vikings and the Scandinavian past is doubtful, but many specific elements remain worthy of consideration, such as the great quantity of skaldic poetry attributed to court poets of the 10th and 11th centuries, the exposed family trees, the self images, the ethical values, all included in these literary writings. Indirectly, the Vikings have also left a window open to their language, culture and activities, through many Old Norse place names and words, found in their former sphere of influence. Some of these place names and words are still in direct use today, almost unchanged, and sheds light on where they settled and what specific places meant to them, as seen in place names like Egilsay (from Eigils Ø meaning Eigil's Island), Ormskirk (from Ormr kirkja meaning Orms Church or Church of the Worm), Meols (from merl meaning Sand Dunes), Snaefell (Snow Fell), Ravenscar (Ravens Rock), Vinland (Land of Wine or Land of Winberry), Kaupanger (Market Harbour), Tórshavn (Thor's Harbour), and the religious centre of Odense, meaning a place where Odin was worshipped. Viking influence is also evident in concepts like the present-day parliamentary body of the Tynwald on the Isle of Man. Common words in everyday English language, like some of the weekdays (Thursday means Thor's day), axle, crook, raft, knife, plough, leather, window, berserk, bylaw, thorp, skerry, husband, heathen, Hell, Norman and ransack stem from the Old Norse of the Vikings and give us an opportunity to understand their interactions with the people and cultures of the British Isles. In the Northern Isles of Shetland and Orkney, Old Norse completely replaced the local languages and over time evolved into the now extinct Norn language. Some modern words and names only emerge and contribute to our understanding after a more intense research of linguistic sources from medieval or later records, such as York (Horse Bay), Swansea (Sveinn's Isle) or some of the place names in Normandy like Tocqueville (Toki's farm). Linguistic and etymological studies continue to provide a vital source of information on the Viking culture, their social structure and history and how they interacted with the people and cultures they met, traded, attacked or lived with in overseas settlements. 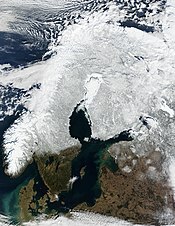 A lot of Old Norse connections are evident in the modern-day languages of Swedish, Norwegian, Danish, Faroese and Icelandic. Old Norse did not exert any great influence on the Slavic languages in the Viking settlements of Eastern Europe. It has been speculated that the reason was the great differences between the two languages, combined with the Rus' Vikings more peaceful businesses in these areas and the fact that they were outnumbered. The Norse named some of the rapids on the Dnieper, but this can hardly be seen from the modern names. A consequence of the available written sources, which may have coloured how the Viking age is perceived as a historical period, is that much more is known of the Vikings' activities in western Europe than in the East. One reason is that the cultures of north-eastern Europe at the time were non-literate, and did not produce a legacy of literature. Another is that the vast majority of written sources on Scandinavia in the Viking Age come from Iceland, a nation originally settled by Norwegian colonists. As a result, there is much more material from the Viking Age about Norway than Sweden, which apart from many runic inscriptions, has almost no written sources from the early Middle Ages. The Norse of the Viking Age could read and write and used a non-standardised alphabet, called runor, built upon sound values. While there are few remains of runic writing on paper from the Viking era, thousands of stones with runic inscriptions have been found where Vikings lived. They are usually in memory of the dead, though not necessarily placed at graves. The use of runor survived into the 15th century, used in parallel with the Latin alphabet. The majority of runic inscriptions from the Viking period are found in Sweden and date from the 11th century. 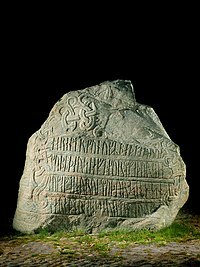 The oldest stone with runic inscriptions was found in Norway and dates to the 4th century, suggesting that runic inscriptions pre-date the Viking period. Many runestones in Scandinavia record the names of participants in Viking expeditions, such as the Kjula runestone that tells of extensive warfare in Western Europe and the Turinge Runestone, which tells of a war band in Eastern Europe. Other runestones mention men who died on Viking expeditions. Among them are around 25 Ingvar runestones in the Mälardalen district of Sweden, erected to commemorate members of a disastrous expedition into present-day Russia in the early 11th century. Runestones are important sources in the study of Norse society and early medieval Scandinavia, not only of the Viking segment of the population. King Haraldr ordered this monument made in memory of Gormr, his father, and in memory of Thyrvé, his mother; that Haraldr who won for himself all of Denmark and Norway and made the Danes Christian. 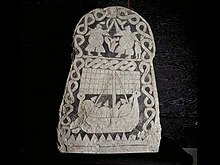 Runestones attest to voyages to locations such as Bath, Greece, Khwaresm, Jerusalem, Italy (as Langobardland), Serkland (i.e. the Muslim world), England (including London), and various places in Eastern Europe. Viking Age inscriptions have also been discovered on the Manx runestones on the Isle of Man. There are numerous burial sites associated with Vikings throughout Europe and their sphere of influence—in Scandinavia, the British Isles, Ireland, Greenland, Iceland, Faeroe Islands, Germany, The Baltic, Russia, etc. The burial practices of the Vikings were quite varied, from dug graves in the ground, to tumuli, sometimes including so-called ship burials. Sweden: Gettlinge gravfält; the cemeteries of Birka, a World Heritage Site; Valsgärde; Gamla Uppsala; Hulterstad gravfält, near Alby; Hulterstad, Öland. Denmark: Jelling, a World Heritage Site; Lindholm Høje; Ladby ship; Mammen chamber tomb and hoard. Estonia: Salme ships – The largest ship burial ground ever uncovered. Scotland: Port an Eilean Mhòir ship burial; Scar boat burial, Orkney. Iceland: Mosfellsbær in Capital Region; the boat burial in Vatnsdalur, Austur-Húnavatnssýsla. 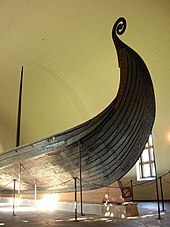 There have been several archaeological finds of Viking ships of all sizes, providing knowledge of the craftsmanship that went into building them. There were many types of Viking ships, built for various uses; the best-known type is probably the longship. Longships were intended for warfare and exploration, designed for speed and agility, and were equipped with oars to complement the sail, making navigation possible independently of the wind. 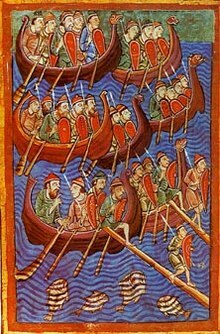 The longship had a long, narrow hull and shallow draught to facilitate landings and troop deployments in shallow water. Longships were used extensively by the Leidang, the Scandinavian defence fleets. The longship allowed the Norse to go Viking, which might explain why this type of ship has become almost synonymous with the concept of Vikings. The longship facilitated far-reaching expeditions, but the Vikings also constructed several other types of ships. 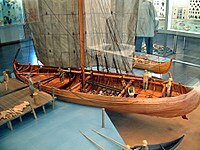 The Vikings built many unique types of watercraft, often used for more peaceful tasks. The knarr was a dedicated merchant vessel designed to carry cargo in bulk. It had a broader hull, deeper draught, and a small number of oars (used primarily to manoeuvre in harbours and similar situations). One Viking innovation was the 'beitass', a spar mounted to the sail that allowed their ships to sail effectively against the wind. It was common for seafaring Viking ships to tow or carry a smaller boat to transfer crews and cargo from the ship to shore. Ships were an integral part of the Viking culture. They facilitated everyday transportation across seas and waterways, exploration of new lands, raids, conquests, and trade with neighbouring cultures. They also held a major religious importance. People with high status were sometimes buried in a ship along with animal sacrifices, weapons, provisions and other items, as evidenced by the buried vessels at Gokstad and Oseberg in Norway and the excavated ship burial at Ladby in Denmark. Ship burials were also practised by Vikings abroad, as evidenced by the excavations of the Salme ships on the Estonian island of Saaremaa. Well-preserved remains of five Viking ships were excavated from Roskilde Fjord in the late 1960s, representing both the longship and the knarr. The ships were scuttled there in the 11th century to block a navigation channel and thus protect Roskilde, then the Danish capital, from seaborne assault. The remains of these ships are on display at the Viking Ship Museum in Roskilde. The Viking society was divided into the three socio-economic classes: Thralls, Karls and Jarls. This is described vividly in the Eddic poem of Rígsþula, which also explains that it was the God Ríg – father of mankind also known as Heimdallr – who created the three classes. Archaeology has confirmed this social structure. Thralls were the lowest ranking class and were slaves. Slaves comprised as much as a quarter of the population. Slavery was of vital importance to Viking society, for everyday chores and large scale construction and also to trade and the economy. Thralls were servants and workers in the farms and larger households of the Karls and Jarls, and they were used for constructing fortifications, ramps, canals, mounds, roads and similar hard work projects. According to the Rigsthula, Thralls were despised and looked down upon. New thralls were supplied by either the sons and daughters of thralls or they were captured abroad. The Vikings often deliberately captured many people on their raids in Europe, to enslave them as thralls. The thralls were then brought back home to Scandinavia by boat, used on location or in newer settlements to build needed structures, or sold, often to the Arabs in exchange for silver. Other names for thrall were 'træl' and 'ty'. Karls were free peasants. They owned farms, land and cattle and engaged in daily chores like ploughing the fields, milking the cattle, building houses and wagons, but used thralls to make ends meet. Other names for Karls were 'bonde' or simply free men. The Jarls were the aristocracy of the Viking society. They were wealthy and owned large estates with huge longhouses, horses and many thralls. The thralls did most of the daily chores, while the Jarls did administration, politics, hunting, sports, visited other Jarls or were abroad on expeditions. When a Jarl died and was buried, his household thralls were sometimes sacrificially killed and buried next to him, as many excavations have revealed. In daily life, there were many intermediate positions in the overall social structure and it is believed that there must have been some social mobility. These details are unclear, but titles and positions like hauldr, thegn, landmand, show mobility between the Karls and the Jarls. Other social structures included the communities of félag in both the civil and the military spheres, to which its members (called félagi) were obliged. A félag could be centred around certain trades, a common ownership of a sea vessel or a military obligation under a specific leader. Members of the latter were referred to as drenge, one of the words for warrior. There were also official communities within towns and villages, the overall defence, religion, the legal system and the Things. Women had a relatively free status in the Nordic countries of Sweden, Denmark and Norway, illustrated in the Icelandic Grágás and the Norwegian Frostating laws and Gulating laws. The paternal aunt, paternal niece and paternal granddaughter, referred to as odalkvinna, all had the right to inherit property from a deceased man. In the absence of male relatives, an unmarried woman with no son could inherit not only property but also the position as head of the family from a deceased father or brother. Such a woman was referred to as Baugrygr, and she exercised all the rights afforded to the head of a family clan – such as the right to demand and receive fines for the slaughter of a family member – until she married, by which her rights were transferred to her new husband. After the age of 20, an unmarried woman, referred to as maer and mey, reached legal majority and had the right to decide her place of residence and was regarded as her own person before the law. An exception to her independence was the right to choose a marriage partner, as marriages were normally arranged by the family. Widows enjoyed the same independent status as unmarried women. A married woman could divorce her husband and remarry. It was also socially acceptable for a free woman to cohabit with a man and have children with him without marrying him, even if that man was married; a woman in such a position was called frilla. There was no distinction made between children born inside or outside marriage: both had the right to inherit property after their parents, and there were no "legitimate" or "illegitimate" children. Women had religious authority and were active as priestesses (gydja) and oracles (sejdkvinna). They were active within art as poets (skalder) and rune masters, and as merchants and medicine women. They may also have been active within military office: the stories about shieldmaidens are unconfirmed, but some archaeological finds such as the Birka female Viking warrior may indicate that at least some women in military authority existed. These liberties gradually disappeared after the introduction of Christianity, and from the late 13th-century, they are no longer mentioned. The three classes were easily recognisable by their appearances. Men and women of the Jarls were well groomed with neat hairstyles and expressed their wealth and status by wearing expensive clothes (often silk) and well crafted jewellery like brooches, belt buckles, necklaces and arm rings. 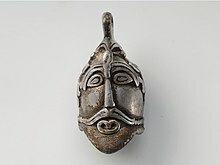 Almost all of the jewellery was crafted in specific designs unique to the Norse (see Viking art). Finger rings were seldom used and earrings were not used at all, as they were seen as a Slavic phenomenon. Most Karls expressed similar tastes and hygiene, but in a more relaxed and inexpensive way. The sagas tell about the diet and cuisine of the Vikings, but first hand evidence, like cesspits, kitchen middens and garbage dumps have proved to be of great value and importance. Undigested remains of plants from cesspits at Coppergate in York have provided much information in this respect. Overall, archaeo-botanical investigations have been undertaken increasingly in recent decades, as a collaboration between archaeologists and palaeoethno-botanists. This new approach sheds light on the agricultural and horticultural practices of the Vikings and their cuisine. Pot of soapstone, partly reconstructed, Viking Age. From Birka Sweden. The combined information from various sources suggests a diverse cuisine and ingredients. Meat products of all kinds, such as cured, smoked and whey-preserved meat, sausages, and boiled or fried fresh meat cuts, were prepared and consumed. There were plenty of seafood, bread, porridges, dairy products, vegetables, fruits, berries and nuts. Alcoholic drinks like beer, mead, bjórr (a strong fruit wine) and, for the rich, imported wine, were served. Certain livestock were typical and unique to the Vikings, including the Icelandic horse, Icelandic cattle, a plethora of sheep breeds, the Danish hen and the Danish goose. The Vikings in York mostly ate beef, mutton, and pork with small amounts of horse meat. Most of the beef and horse leg bones were found split lengthways, to extract the marrow. The mutton and swine were cut into leg and shoulder joints and chops. The frequent remains of pig skull and foot bones found on house floors indicate that brawn and trotters were also popular. Hens were kept for both their meat and eggs, and the bones of game birds such as black grouse, golden plover, wild ducks, and geese have also been found. Seafood was important, in some places even more so than meat. Whales and walrus were hunted for food in Norway and the north-western parts of the North Atlantic region, and seals were hunted nearly everywhere. Oysters, mussels and shrimps were eaten in large quantities and cod and salmon were popular fish. In the southern regions, herring was also important. Milk and buttermilk were popular, both as cooking ingredients and drinks, but were not always available, even at farms. Milk came from cows, goats and sheep, with priorities varying from location to location, and fermented milk products like skyr or surmjölk were produced as well as butter and cheese. Food was often salted and enhanced with spices, some of which were imported like black pepper, while others were cultivated in herb gardens or harvested in the wild. Home grown spices included caraway, mustard and horseradish as evidenced from the Oseberg ship burial or dill, coriander, and wild celery, as found in cesspits at Coppergate in York. Thyme, juniper berry, sweet gale, yarrow, rue and peppercress were also used and cultivated in herb gardens. Vikings collected and ate fruits, berries and nuts. Apple (wild crab apples), plums and cherries were part of the diet, as were rose hips and raspberry, wild strawberry, blackberry, elderberry, rowan, hawthorn and various wild berries, specific to the locations. Hazelnuts were an important part of the diet in general and large amounts of walnut shells have been found in cities like Hedeby. The shells were used for dyeing, and it is assumed that the nuts were consumed. The invention and introduction of the mouldboard plough revolutionised agriculture in Scandinavia in the early Viking Age and made it possible to farm even poor soils. In Ribe, grains of rye, barley, oat and wheat dated to the 8th century have been found and examined, and are believed to have been cultivated locally. Grains and flour were used for making porridges, some cooked with milk, some cooked with fruit and sweetened with honey, and also various forms of bread. Remains of bread from primarily Birka in Sweden were made of barley and wheat. It is unclear if the Norse leavened their breads, but their ovens and baking utensils suggest that they did. Flax was a very important crop for the Vikings: it was used for oil extraction, food consumption and most importantly the production of linen. More than 40% of all known textile recoveries from the Viking Age can be traced as linen. This suggests a much higher actual percentage, as linen is poorly preserved compared to wool for example. The quality of food for common people was not always particularly high. The research at Coppergate shows that the Vikings in York made bread from whole meal flour — probably both wheat and rye – but with the seeds of cornfield weeds included. Corncockle (Agrostemma), would have made the bread dark-coloured, but the seeds are poisonous, and people who ate the bread might have become ill. Seeds of carrots, parsnip, and brassicas were also discovered, but they were poor specimens and tend to come from white carrots and bitter tasting cabbages. The rotary querns often used in the Viking Age left tiny stone fragments (often from basalt rock) in the flour, which when eaten wore down the teeth. The effects of this can be seen on skeletal remains of that period. Sports were widely practised and encouraged by the Vikings. Sports that involved weapons training and developing combat skills were popular. This included spear and stone throwing, building and testing physical strength through wrestling (see glima), fist fighting, and stone lifting. In areas with mountains, mountain climbing was practised as a sport. Agility and balance were built and tested by running and jumping for sport, and there is mention of a sport that involved jumping from oar to oar on the outside of a ship's railing as it was being rowed. Swimming was a popular sport and Snorri Sturluson describes three types: diving, long-distance swimming and a contest in which two swimmers try to duck one another. Children often participated in some of the sport disciplines and women have also been mentioned as swimmers, although it is unclear if they took part in competition. King Olaf Tryggvason was hailed as a master of both mountain climbing and oar-jumping, and was said to have excelled in the art of knife juggling as well. Skiing and ice skating were the primary winter sports of the Vikings, although skiing was also used as everyday means of transport in winter and in the colder regions of the north. Horse fighting was practised for sport, although the rules are unclear. It appears to have involved two stallions pitted against each other, within smell and sight of fenced-off mares. Whatever the rules were, the fights often resulted in the death of one of the stallions. Icelandic sources refer to the sport of knattleik. A ball game akin to hockey, knattleik involved a bat and a small hard ball and was usually played on a smooth field of ice. The rules are unclear, but it was popular with both adults and children, even though it often led to injuries. Knattleik appears to have been played only in Iceland, where it attracted many spectators, as did horse fighting. Hunting, as a sport, was limited to Denmark, where it was not regarded as an important occupation. Birds, deer, hares and foxes were hunted with bow and spear, and later with crossbows. The techniques were stalking, snare and traps and par force hunting with dog packs. Both archaeological finds and written sources testify to the fact that the Vikings set aside time for social and festive gatherings. Board games and dice games were played as a popular pastime at all levels of society. Preserved gaming pieces and boards show game boards made of easily available materials like wood, with game pieces manufactured from stone, wood or bone, while other finds include elaborately carved boards and game pieces of glass, amber, antler or walrus tusk, together with materials of foreign origin, such as ivory. The Vikings played several types of tafl games; hnefatafl, nitavl (Nine Men's Morris) and the less common kvatrutafl. Chess also appeared at the end of the Viking Age. Hnefatafl is a war game, in which the object is to capture the king piece—a large hostile army threatens and the king's men have to protect the king. It was played on a board with squares using black and white pieces, with moves made according to dice rolls. The Ockelbo Runestone shows two men engaged in Hnefatafl, and the sagas suggest that money or valuables could have been involved in some dice games. On festive occasions storytelling, skaldic poetry, music and alcoholic drinks, like beer and mead, contributed to the atmosphere. Music was considered an art form and music proficiency as fitting for a cultivated man. The Vikings are known to have played instruments including harps, fiddles, lyres and lutes. Experimental archaeology of the Viking Age is a flourishing branch and several places have been dedicated to this technique, such as Jorvik Viking Centre in the United Kingdom, Sagnlandet Lejre and Ribe Viking Center [da] in Denmark, Foteviken Museum in Sweden or Lofotr Viking Museum in Norway. Viking-age reenactors have undertaken experimental activities such as iron smelting and forging using Norse techniques at Norstead in Newfoundland for example. 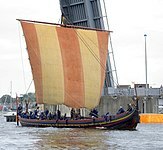 On 1 July 2007, the reconstructed Viking ship Skuldelev 2, renamed Sea Stallion, began a journey from Roskilde to Dublin. The remains of that ship and four others were discovered during a 1962 excavation in the Roskilde Fjord. Tree-ring analysis has shown the ship was built of oak in the vicinity of Dublin in about 1042. Seventy multi-national crew members sailed the ship back to its home, and Sea Stallion arrived outside Dublin's Custom House on 14 August 2007. The purpose of the voyage was to test and document the seaworthiness, speed, and manoeuvrability of the ship on the rough open sea and in coastal waters with treacherous currents. The crew tested how the long, narrow, flexible hull withstood the tough ocean waves. The expedition also provided valuable new information on Viking longships and society. The ship was built using Viking tools, materials, and much the same methods as the original ship. Other vessels, often replicas of the Gokstad ship (full- or half-scale) or Skuldelev I have been built and tested as well. The Snorri (a Skuldelev I Knarr), was sailed from Greenland to Newfoundland in 1998. Knowledge about the arms and armour of the Viking age is based on archaeological finds, pictorial representation, and to some extent on the accounts in the Norse sagas and Norse laws recorded in the 13th century. According to custom, all free Norse men were required to own weapons and were permitted to carry them at all times. These arms were indicative of a Viking's social status: a wealthy Viking had a complete ensemble of a helmet, shield, mail shirt, and sword. 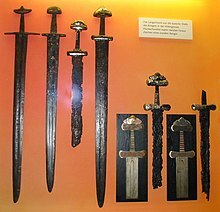 However, swords were rarely used in battle, probably not sturdy enough for combat and most likely only used as symbolic or decorative items. A typical bóndi (freeman) was more likely to fight with a spear and shield, and most also carried a seax as a utility knife and side-arm. Bows were used in the opening stages of land battles and at sea, but they tended to be considered less "honourable" than melee weapons. Vikings were relatively unusual for the time in their use of axes as a main battle weapon. The Húscarls, the elite guard of King Cnut (and later of King Harold II) were armed with two-handed axes that could split shields or metal helmets with ease. The Vikings established and engaged in extensive trading networks throughout the known world and had a profound influence on the economic development of Europe and Scandinavia not the least. Except for the major trading centres of Ribe, Hedeby and the like, the Viking world was unfamiliar with the use of coinage and was based on so called bullion economy. Silver was the most common metal in the economy, although gold was also used to some extent. Silver circulated in the form of bars, or ingots, as well as in the form of jewellery and ornaments. A large number of silver hoards from the Viking Age have been uncovered, both in Scandinavia and the lands they settled. 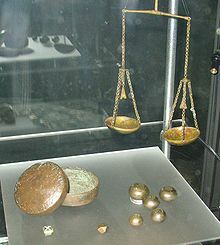 [better source needed] Traders carried small scales, enabling them to measure weight very accurately, so it was possible to have a very precise system of trade and exchange, even without a regular coinage. Spices were obtained from Chinese and Persian traders, who met with the Viking traders in Russia. Vikings used homegrown spices and herbs like caraway, thyme, horseradish and mustard, but imported cinnamon. Glass was much prized by the Norse. The imported glass was often made into beads for decoration and these have been found in their thousands. Åhus in Scania and the old market town of Ribe had major production of glass beads. Silk was a very important commodity obtained from Byzantium (modern day Istanbul) and China. It was valued by many European cultures of the time, and the Vikings used it to illustrate status such as wealth and nobility. Many of the archaeological finds in Scandinavia include silk. Wine was imported from France and Germany as a drink of the wealthy, to vary the regular mead and beer. 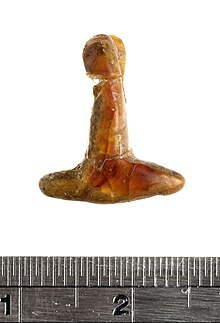 Mjölnir, hammer of Thor, made of amber. Amber – the fossilised resin of the pine tree – was frequently found on the North Sea and Baltic coastline. It was worked into beads and ornamental objects, before being traded. (See also the Amber Road). Fur was also exported as it provided warmth. This included the furs of pine martens, foxes, bears, otters and beavers. Cloth and wool. The Vikings were skilled spinners and weavers and exported woollen cloth of a high quality. Down was collected and exported. The Norwegian west coast supplied eiderdowns and sometimes feathers were bought from the Samis. Down was used for bedding and quilted clothing. Fowling on the steep slopes and cliffs was dangerous work and was often lethal. Slaves, known as thralls in Old Norse. On their raids, the Vikings captured many people, among them monks and clergymen. They were sometimes sold as slaves to Arab merchants in exchange for silver. Other exports included weapons, walrus ivory, wax, salt and cod. As one of the more exotic exports, hunting birds were sometimes provided from Norway to the European aristocracy, from the 10th century. Many of these goods were also traded within the Viking world itself, as well as goods such as soapstone and whetstone. Soapstone was traded with the Norse on Iceland and in Jutland, who used it for pottery. Whetstones were traded and used for sharpening weapons, tools and knives. There are indications from Ribe and surrounding areas, that the extensive medieval trade with oxen and cattle from Jutland (see Ox Road), reach as far back as c. 720 AD. This trade satisfied the Vikings' need for leather and meat to some extent, and perhaps hides for parchment production on the European mainland. Wool was also very important as a domestic product for the Vikings, to produce warm clothing for the cold Scandinavian and Nordic climate, and for sails. Sails for Viking ships required large amounts of wool, as evidenced by experimental archaeology. There are archaeological signs of organised textile productions in Scandinavia, reaching as far back as the early Iron Ages. Artisans and craftsmen in the larger towns were supplied with antlers from organised hunting with large-scale reindeer traps in the far north. They were used as raw material for making everyday utensils like combs. In England the Viking Age began dramatically on 8 June 793 when Norsemen destroyed the abbey on the island of Lindisfarne. The devastation of Northumbria's Holy Island shocked and alerted the royal courts of Europe to the Viking presence. "Never before has such an atrocity been seen," declared the Northumbrian scholar Alcuin of York. Medieval Christians in Europe were totally unprepared for the Viking incursions and could find no explanation for their arrival and the accompanying suffering they experienced at their hands save the "Wrath of God". More than any other single event, the attack on Lindisfarne demonised perception of the Vikings for the next twelve centuries. Not until the 1890s did scholars outside Scandinavia begin to seriously reassess the achievements of the Vikings, recognizing their artistry, technological skills, and seamanship. Norse Mythology, sagas, and literature tell of Scandinavian culture and religion through tales of heroic and mythological heroes. 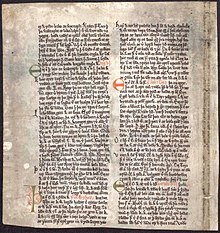 Early transmission of this information was primarily oral, and later texts were reliant upon the writings and transcriptions of Christian scholars, including the Icelanders Snorri Sturluson and Sæmundur fróði. Many of these sagas were written in Iceland, and most of them, even if they had no Icelandic provenance, were preserved there after the Middle Ages due to the continued interest of Icelanders in Norse literature and law codes. The 200-year Viking influence on European history is filled with tales of plunder and colonisation, and the majority of these chronicles came from western witnesses and their descendants. 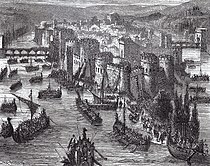 Less common, though equally relevant, are the Viking chronicles that originated in the east, including the Nestor chronicles, Novgorod chronicles, Ibn Fadlan chronicles, Ibn Rusta chronicles, and brief mentions by Photius, patriarch of Constantinople, regarding their first attack on the Byzantine Empire. Other chroniclers of Viking history include Adam of Bremen, who wrote, in the fourth volume of his Gesta Hammaburgensis Ecclesiae Pontificum, "[t]here is much gold here (in Zealand), accumulated by piracy. These pirates, which are called wichingi by their own people, and Ascomanni by our own people, pay tribute to the Danish king." In 991, the Battle of Maldon between Viking raiders and the inhabitants of Maldon in Essex was commemorated with a poem of the same name. Early modern publications, dealing with what is now called Viking culture, appeared in the 16th century, e.g. Historia de gentibus septentrionalibus (Olaus Magnus, 1555), and the first edition of the 13th-century Gesta Danorum of Saxo Grammaticus in 1514. The pace of publication increased during the 17th century with Latin translations of the Edda (notably Peder Resen's Edda Islandorum of 1665). In Scandinavia, the 17th-century Danish scholars Thomas Bartholin and Ole Worm and the Swede Olaus Rudbeck used runic inscriptions and Icelandic sagas as historical sources. An important early British contributor to the study of the Vikings was George Hicke, who published his Linguarum vett. septentrionalium thesaurus in 1703–05. During the 18th century, British interest and enthusiasm for Iceland and early Scandinavian culture grew dramatically, expressed in English translations of Old Norse texts and in original poems that extolled the supposed Viking virtues. The word "viking" was first popularised at the beginning of the 19th century by Erik Gustaf Geijer in his poem, The Viking. Geijer's poem did much to propagate the new romanticised ideal of the Viking, which had little basis in historical fact. The renewed interest of Romanticism in the Old North had contemporary political implications. The Geatish Society, of which Geijer was a member, popularised this myth to a great extent. Another Swedish author who had great influence on the perception of the Vikings was Esaias Tegnér, member of the Geatish Society, who wrote a modern version of Friðþjófs saga hins frœkna, which became widely popular in the Nordic countries, the United Kingdom, and Germany. Fascination with the Vikings reached a peak during the so-called Viking revival in the late 18th and 19th centuries as a branch of Romantic nationalism. In Britain this was called Septentrionalism, in Germany "Wagnerian" pathos, and in the Scandinavian countries Scandinavism. Pioneering 19th-century scholarly editions of the Viking Age began to reach a small readership in Britain, archaeologists began to dig up Britain's Viking past, and linguistic enthusiasts started to identify the Viking-Age origins of rural idioms and proverbs. The new dictionaries of the Old Norse language enabled the Victorians to grapple with the primary Icelandic sagas. Until recently, the history of the Viking Age was largely based on Icelandic sagas, the history of the Danes written by Saxo Grammaticus, the Russian Primary Chronicle, and Cogad Gáedel re Gallaib. Few scholars still accept these texts as reliable sources, as historians now rely more on archaeology and numismatics, disciplines that have made valuable contributions toward understanding the period. 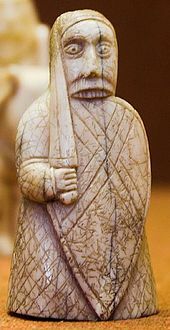 The romanticised idea of the Vikings constructed in scholarly and popular circles in northwestern Europe in the 19th and early 20th centuries was a potent one, and the figure of the Viking became a familiar and malleable symbol in different contexts in the politics and political ideologies of 20th-century Europe. In Normandy, which had been settled by Vikings, the Viking ship became an uncontroversial regional symbol. In Germany, awareness of Viking history in the 19th century had been stimulated by the border dispute with Denmark over Schleswig-Holstein and the use of Scandinavian mythology by Richard Wagner. The idealised view of the Vikings appealed to Germanic supremacists who transformed the figure of the Viking in accordance with the ideology of the Germanic master race. 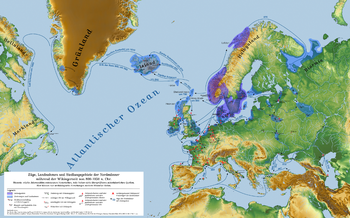 Building on the linguistic and cultural connections between Norse-speaking Scandinavians and other Germanic groups in the distant past, Scandinavian Vikings were portrayed in Nazi Germany as a pure Germanic type. The cultural phenomenon of Viking expansion was re-interpreted for use as propaganda to support the extreme militant nationalism of the Third Reich, and ideologically informed interpretations of Viking paganism and the Scandinavian use of runes were employed in the construction of Nazi mysticism. Other political organisations of the same ilk, such as the former Norwegian fascist party Nasjonal Samling, similarly appropriated elements of the modern Viking cultural myth in their symbolism and propaganda. Soviet and earlier Slavophile historians emphasized a Slavic rooted foundation in contrast to the Normanist theory of the Vikings conquering the Slavs and founding the Kievan Rus'. They accused Normanist theory proponents of distorting history by depicting the Slavs as undeveloped primitives. In contrast, Soviet historians stated that the Slavs laid the foundations of their statehood long before the Norman/Viking raids, while the Norman/Viking invasions only served to hinder the historical development of the Slavs. They argued that Rus' composition was Slavic and that Rurik and Oleg' success was rooted in their support from within the local Slavic aristocracy.. After the dissolution of the USSR, Novgorod acknowledged its Viking history by incorporating a Viking ship into its logo. Led by the operas of German composer Richard Wagner, such as Der Ring des Nibelungen, Vikings and the Romanticist Viking Revival have inspired many creative works. These have included novels directly based on historical events, such as Frans Gunnar Bengtsson's The Long Ships (which was also released as a 1963 film), and historical fantasies such as the film The Vikings, Michael Crichton's Eaters of the Dead (movie version called The 13th Warrior), and the comedy film Erik the Viking. The vampire Eric Northman, in the HBO TV series True Blood, was a Viking prince before being turned into a vampire. Vikings appear in several books by the Danish American writer Poul Anderson, while British explorer, historian, and writer Tim Severin authored a trilogy of novels in 2005 about a young Viking adventurer Thorgils Leifsson, who travels around the world. In 1962, American comic book writer Stan Lee and his brother Larry Lieber, together with Jack Kirby, created the Marvel Comics superhero Thor, which they based on the Norse god of the same name. The character is featured in the 2011 Marvel Studios film Thor and its sequels Thor: The Dark World and Thor: Ragnarok. The character also appears in the 2012 film The Avengers and its associated animated series. Since the 1960s, there has been rising enthusiasm for historical reenactment. While the earliest groups had little claim for historical accuracy, the seriousness and accuracy of reenactors has increased. The largest such groups include The Vikings and Regia Anglorum, though many smaller groups exist in Europe, North America, New Zealand, and Australia. Many reenactor groups participate in live-steel combat, and a few have Viking-style ships or boats. The Minnesota Vikings of the National Football League are so-named owing to the large Scandinavian population in the US state of Minnesota. During the banking boom of the first decade of the twenty-first century, Icelandic financiers came to be styled as útrásarvíkingar (roughly 'raiding vikings'). Modern reconstructions of Viking mythology have shown a persistent influence in late 20th- and early 21st-century popular culture in some countries, inspiring comics, role-playing games, computer games, and music, including Viking metal, a subgenre of heavy metal music. Apart from two or three representations of (ritual) helmets—with protrusions that may be either stylised ravens, snakes, or horns—no depiction of the helmets of Viking warriors, and no preserved helmet, has horns. The formal, close-quarters style of Viking combat (either in shield walls or aboard "ship islands") would have made horned helmets cumbersome and hazardous to the warrior's own side. Historians therefore believe that Viking warriors did not wear horned helmets; whether such helmets were used in Scandinavian culture for other, ritual purposes, remains unproven. The general misconception that Viking warriors wore horned helmets was partly promulgated by the 19th-century enthusiasts of Götiska Förbundet, founded in 1811 in Stockholm. They promoted the use of Norse mythology as the subject of high art and other ethnological and moral aims. The Vikings were often depicted with winged helmets and in other clothing taken from Classical antiquity, especially in depictions of Norse gods. This was done to legitimise the Vikings and their mythology by associating it with the Classical world, which had long been idealised in European culture. The latter-day mythos created by national romantic ideas blended the Viking Age with aspects of the Nordic Bronze Age some 2,000 years earlier. Horned helmets from the Bronze Age were shown in petroglyphs and appeared in archaeological finds (see Bohuslän and Vikso helmets). They were probably used for ceremonial purposes. Cartoons like Hägar the Horrible and Vicky the Viking, and sports kits such as those of the Minnesota Vikings and Canberra Raiders have perpetuated the myth of the horned helmet. Viking helmets were conical, made from hard leather with wood and metallic reinforcement for regular troops. The iron helmet with mask and mail was for the chieftains, based on the previous Vendel-age helmets from central Sweden. The only original Viking helmet discovered is the Gjermundbu helmet, found in Norway. This helmet is made of iron and has been dated to the 10th century. The image of wild-haired, dirty savages sometimes associated with the Vikings in popular culture is a distorted picture of reality. Viking tendencies were often misreported, and the work of Adam of Bremen, among others, told largely disputable tales of Viking savagery and uncleanliness. There is no evidence that Vikings drank out of the skulls of vanquished enemies. This was a misconception based on a passage in the skaldic poem Krákumál speaking of heroes drinking from ór bjúgviðum hausa (branches of skulls). This was a reference to drinking horns, but was mistranslated in the 17th century as referring to the skulls of the slain. Studies of genetic diversity provide indication of the origin and expansion of the Norse population. Haplogroup I-M253 (defined by specific genetic markers on the Y chromosome) mutation occurs with the greatest frequency among Scandinavian males: 35% in Norway, Denmark, and Sweden, and peaking at 40% in south-western Finland. It is also common near the southern Baltic and North Sea coasts, and successively decreases further to the south geographically. Female descent studies show evidence of Norse descent in areas closest to Scandinavia, such as the Shetland and Orkney islands. Inhabitants of lands farther away show most Norse descent in the male Y-chromosome lines. A specialised genetic and surname study in Liverpool showed marked Norse heritage: up to 50% of males of families that lived there before the years of industrialisation and population expansion. High percentages of Norse inheritance—tracked through the R-M420 haplotype—were also found among males in the Wirral and West Lancashire. This was similar to the percentage of Norse inheritance found among males in the Orkney Islands. Recent research suggests that the Celtic warrior Somerled, who drove the Vikings out of western Scotland and was the progenitor of Clan Donald, may have been of Viking descent, a member of haplogroup R-M420. ^ a b Roesdahl, pp. 9–22. ^ Archaeologists find evidence of Vikings’ presence in Belarus. Lepel Regional Executive Committee. ^ Ancient Ukraine: Did Swedish Vikings really found Kyiv Rus? Business Ukraine. ^ Johnni Langer, "The origins of the imaginary viking", Viking Heritage Magazine, Gotland University/Centre for Baltic Studies. Visby (Sweden), n. 4, 2002. ^ Eldar Heide (2005). "Víking – 'rower shifting'? An etymological contribution" (PDF). Arkiv för Nordisk Filologi. 120: 41–54. Retrieved 20 April 2015. ^ Kvilhaug, Maria. "The Tribe that Gave Vikings Their Name?". Freya. Retrieved 17 March 2015. ^ Enoksen, Lars-Magnar, Skånska runstenar (Lund 1999) s.89 f.
^ Jesch, Judith (2001). Ships and Men in the Late Viking Age: The Vocabulary of Runic Inscriptions and Skaldic Verse. Woodbridge: Boydell Press. 2001:56, 180-81. ISBN 0-85115-826-9. ^ Eldar Heide (2008). "Viking, week, and Widsith. A reply to Harald Bjorvand". Centre of Medieval Studies (University of Bergen). Arkiv för Nordisk Filologi. 123: 23–28. Retrieved 20 April 2015. ^ Anatoly Liberman (15 July 2009). "What Did The Vikings Do Before They Began to Play Football? - OUPblog". ^ Bernard Mees (2012). "Taking Turns: linguistic economy and the name of the Vikings". Royal Melbourne Institute of Technology (RMIT). Arkiv för Nordisk Filologi. 127: 5–12. Retrieved 20 April 2015. ^ Eldar Heide (2005). "Víking - 'rower shifting'? An etymological contribution" (PDF). Arkiv för Nordisk Filologi. 120: 41–54. Retrieved 20 April 2015. ^ a b Hans C. Boas (13 May 2014). "Indo-European Lexicon - PIE Etymon and IE Reflexes". Linguistics Research Center. The University of Texas at Austin. Retrieved 20 April 2015. ^ Beard, David. "The Term "Viking"". archeurope.com. Archaeology in Europe. Archived from the original on 7 April 2012. Retrieved 23 April 2014. ^ Wolf 2004, p. 2. ^ Smyth, Alfred (1970–73). Saga-book of the Viking Society. University College London. pp. 101–117. ^ Educational Company of Ireland 2000, p. 472. ^ Brookes 2004, p. 297. ^ a b D'Amato 2010, p. 3. ^ Douglas Harper: "Russia", in Online Etymology Dictionary. A private homepage project. ^ a b "Land of the Rus – Viking explorations to the east". National Museum of Denmark. Retrieved 20 April 2015. ^ a b "Dangerous journeys to Eastern Europe and Russia". National Museum of Denmark. Retrieved 20 April 2015. ^ Peter Sawyer, The Viking Expansion, The Cambridge History of Scandinavia, Issue 1 (Knut Helle, ed., 2003), p. 105. ^ Lund, Niels "The Danish Empire and the End of the Viking Age", in Sawyer, History of the Vikings, pp. 167–81. ^ Lawson, M K (2004). "Cnut: England's Viking King 1016-35". The History Press Ltd, 2005, ISBN 978-0582059702. ^ "History of Northumbria: Viking era 866 AD–1066 AD" www.englandnortheast.co.uk. ^ Toyne, Stanley Mease. The Scandinavians in history Pg.27. 1970. ^ Langmoen IA (4 April 2012). "The Norse discovery of America". Neurosurgery. 57 (6): 1076–87, discussion 1076–1087. doi:10.1227/01.neu.0000144825.92264.c4. PMID 16331154. ^ Ross, Valerie (31 May 2011). "Climate change froze Vikings out of Greenland". Discover. Kalmback Publishing. Retrieved 6 April 2013. ^ "Vikings' Barbaric Bad Rap Beginning to Fade". News.nationalgeographic.com. 28 October 2010. Retrieved 21 May 2012. ^ "Los vikingos en Al-Andalus (abstract available in English)" (PDF). Jesús Riosalido. 1997. Archived from the original (PDF) on 18 July 2011. Retrieved 11 May 2010. ^ John Haywood: Penguin Historical Atlas of the Vikings, Penguin (1996). Detailed maps of Viking settlements in Scotland, Ireland, England, Iceland and Normandy. ^ Sawyer, P. H. (15 April 2013). Kings and Vikings: Scandinavia and Europe AD 700–1100. Routledge. ISBN 9781134947775. ^ Haine, Thomas (1 March 2008). "What did the Viking discoverers of America know of the North Atlantic Environment?". Weather. 63 (3): 60–65. Bibcode:2008Wthr...63...60H. doi:10.1002/wea.150. ISSN 1477-8696. ^ Matthias Schulz (27 August 2010). "'Sensational' Discovery: Archeologists Find Gateway to the Viking Empire". Spiegel Online. Spiegel Online International. Retrieved 27 February 2014. ^ Lotte Flugt Kold (3 November 2014). "Dannevirke". danmarkshistorien.dk (in Danish). Aarhus University. Retrieved 20 December 2014. ^ Näsman, Ulf (1 November 2000). "Raids, Migrations, and Kingdoms". Acta Archaeologica. 71 (1): 1–7. doi:10.1034/j.1600-0390.2000.d01-1.x. ISSN 1600-0390. ^ Dictionnaire d'histoire de France, Perrin, Alain Decaux and André Castelot, 1981, pp. 184–85. ISBN 2-7242-3080-9. ^ Macauley Richardson, Lloyd. "Books: Eurasian Exploration". Policy Review. Hoover Institution. Archived from the original on 16 December 2009. ^ Crone, Patricia. Meccan trade and the rise of Islam. First Georgias Press. 2004. ^ "Viking expeditions and raids". National Museum of Denmark. Retrieved 20 April 2015. ^ Richards, J.D. (2005). The Vikings : a very short introduction. New York: Oxford University Press. p. 50. ^ "Written sources shed light on Viking travels". National Museum of Denmark. Retrieved 20 April 2015. ^ Hall, 2010, pp. 8 passim. ^ See List of English words of Old Norse origin for further explanations on specific words. ^ See information on the "Slavonic and Norse names of the Dnieper rapids" on Trade route from the Varangians to the Greeks. ^ Jelling stones. Encyclopædia Britannica. 2008. ^ Medieval Archaeology: An Encyclopaedia (Pamela Crabtree, ed., 2001), "Vikings," p. 510. ^ The Hemlanden cemetery located here is the largest Viking Period cemetery in Scandinavia Phillip Pulsiano; Kirsten Wolf, eds. (1993). Medieval Scandinavia: An Encyclopedia (Illustrated ed.). United Kingdom: Taylor & Francis. pp. 238–39. ISBN 978-0-8240-4787-0. ^ See also Jon M. Erlandson. ^ A comprehensive list of registered pagan graves in Iceland, can be found in Eldjárn & Fridriksson (2000): Kuml og haugfé. ^ Dale Mackenzie Brown (28 February 2000). "The Fate of Greenland's Vikings". Archaeology. the Archaeological Institute of America. Retrieved 22 February 2014. ^ Longships are sometimes erroneously called drakkar, a corruption of "dragon" in Norse. ^ Hadingham, Evan: Secrets of Viking Ships (05.09.00) NOVA science media. ^ Durham, Keith: Viking Longship Osprey Publishing, Oxford, 2002. ^ Ian Heath, The Vikings, p. 4, Osprey Publishing, 1985. ^ Curry, Andrew (10 June 2013). "The First Vikings". Archaeology. the Archaeological Institute of America. Retrieved 22 February 2014. ^ a b Roesdahl, pp. 38–48, 61–71. ^ "Vikings may have first taken to seas to find women, slaves". Science. 15 April 2016. ^ Mari Kildah (5 December 2013). "Double graves with headless slaves". University of Oslo. Retrieved 23 June 2014. ^ a b c d e Borgström Eva (in Swedish): Makalösa kvinnor: könsöverskridare i myt och verklighet (Marvelous women : gender benders in myth and reality) Alfabeta/Anamma, Stockholm 2002. ISBN 91-501-0191-9 (inb.). Libris 8707902. ^ Borgström Eva(in Swedish): Makalösa kvinnor: könsöverskridare i myt och verklighet (Marvelous women : gender benders in myth and reality) Alfabeta/Anamma, Stockholm 2002. ISBN 91-501-0191-9 (inb.). Libris 8707902. ^ "Appearance – What did the Vikings look like?". National Museum of Denmark. Retrieved 20 April 2015. ^ Sk. V. Gudjonsson (1941): Folkekost og sundhedsforhold i gamle dage. Belyst igennem den oldnordiske Litteratur. (Dvs. først og fremmest de islandske sagaer). København. (in Danish) Short description in English: Diet and health in previous times, as revealed in the Old Norse Literature, especially the Icelandic Sagas. ^ a b c Pernille Rohde Sloth, Ulla Lund Hansen & Sabine Karg (2013). "Viking Age garden plants from southern Scandinavia – diversity, taphonomy and cultural aspect" (PDF). Danish Journal of Archaeology. Retrieved 19 June 2014. ^ This will cause a lactic acid fermentation process to occur. ^ "Forråd til vinteren – Salte, syrne, røge og tørre [Supplies for the winter – curing, fermenting, smoking and drying]". Ribe Vikingecenter (in Danish). Retrieved 20 April 2015. ^ "Viking Food". National Museum of Denmark. Retrieved 20 April 2015. ^ See the article on the Northern European short-tailed sheep for specific information. In southern Scandinavia (ie. Denmark), the heath sheep of Lüneburger Heidschnucke was raised and kept. ^ "The animals on the farm – Genetic connection". Ribe Vikingecenter. Retrieved 19 April 2015. ^ "Poultry". Danish Agricultural Museum. Archived from the original on 19 April 2015. Retrieved 19 April 2015. ^ O'Conner, Terry. 1999? "The Home – Food and Meat." Viking Age York. Jorvik Viking Centre. ^ Nedkvitne, Arnved. "Fishing, Whaling and Seal Hunting." in Pulsiano, Phillip (1993). Medieval Scandinavia: An Encyclopedia. Garland Reference Library of the Humanities. ^ Inge Bødker Enghoff (2013). Hunting, fishing and animal husbandry at The Farm Beneath The Sand, Western Greenland. Man & Society. 28. the Greenland National Museum, Dansk Polar Center. ISBN 9788763512602. Archived from the original on 21 April 2016. Retrieved 23 June 2014. ^ a b "A Viking Feast – an abundance of foods". Ribe Vikingecenter. Archived from the original on 14 July 2014. Retrieved 19 June 2014. ^ Fondén, R; Leporanta, K; Svensson, U (2007). "Chapter 7. Nordic/Scandinavian Fermented Milk Products". In Tamime, Adnan (ed.). Fermented Milks. Blackwell. doi:10.1002/9780470995501.ch7. ISBN 978-0632064588. ^ a b "The Seastallion from Glendalough" (PDF) (in Danish). Vikingeskibsmuseet. Retrieved 19 June 2014. ^ a b Hall, A. R. 1999? "The Home: Food – Fruit, Grain and Vegetable." Viking Age York. The Jorvik Viking Centre. ^ "The farm crops". Ribe Vikingecenter. Retrieved 19 April 2015. ^ a b "From grains to bread – coarse, heavy and filling". Ribe Vikingecenter (in Danish). Archived from the original on 14 July 2014. Retrieved 19 June 2014. ^ a b Isak Ladegaard (19 November 2012). "How Vikings killed time". ScienceNordic. Retrieved 1 March 2014. ^ a b c "Games and entertainment in the Viking period". National Museum of Denmark. Retrieved 20 April 2015. ^ Darrell Markewitz 1998–2010. "Iron Smelting at the Norse Encampment – Daily Life in the Viking Age circa 1000 AD at Vinland. The Viking Encampment living history program at Parks Canada L'Anse aux Meadows NHSC in Newfoundland". Warehamforge.ca. Retrieved 21 May 2012. ^ Return of Dublin's Viking Warship Archived 18 October 2008 at the Wayback Machine. Retrieved 14 November 2007. ^ "Beyond Lands' End: Viking Voyage 1000". Dougcabot.com. Archived from the original on 30 March 2012. Retrieved 21 May 2012. ^ "Scans of Viking Swords Reveal a Slice of Norse Culture". Live Science. Retrieved 15 April 2017. ^ Fedrigo, Anna; Grazzi, Francesco; Williams, Alan R.; Panzner, Tobias; Lefmann, Kim; Lindelof, Poul Erik; Jørgensen, Lars; Pentz, Peter; Scherillo, Antonella (1 April 2017). "Extraction of archaeological information from metallic artefacts—A neutron diffraction study on Viking swords". Journal of Archaeological Science: Reports. 12: 425–36. doi:10.1016/j.jasrep.2017.02.014. ^ Shona Grimbly (16 August 2013). Encyclopedia of the Ancient World. Routledge. pp. 121–. ISBN 978-1-136-78688-4. ^ Dennis Howard Green; Frank Siegmund (2003). The Continental Saxons from the Migration Period to the Tenth Century: An Ethnographic Perspective. Boydell Press. pp. 306–. ISBN 978-1-84383-026-9. ^ Graham-Campbell, James: The Viking World, Frances Lincoln Ltd, London (2013). Maps of trade routes. ^ Andrew Curry (July 2008). "Raiders or Traders?". Smithsonian Magazine. Smithsonian Institution. Retrieved 24 February 2014. ^ "Herbs, spices and vegetables in the Viking period". National Museum of Denmark. Retrieved 20 April 2015. ^ Heidi Michelle Sherman (2008). Barbarians come to Market: The Emporia of Western Eurasia from 500 BC to AD 1000. ProQuest LLC. pp. 250–55. ISBN 9780549718161. Retrieved 24 February 2014. ^ HL Renart of Berwick: Glass Beads of the Viking Age. An inquiry into the glass beads of the Vikings. Sourced information and pictures. ^ Glass and Amber Regia Anglorum. Sourced information and pictures. ^ Yngve Vogt (1 November 2013). "Norwegian Vikings purchased silk from Persia". Apollon – research magazine. University of Oslo. Retrieved 24 February 2014. ^ Marianne Vedeler: Silk for The Vikings, Oxbow 2014. ^ Elizabeth Wincott Heckett (2002). "Irish Viking Age silks and their place in Hiberno-Norse society". Department of Archaeology, University College Cork, NUI Cork, Ireland. Textile Society of America Symposium Proceedings. Retrieved 28 February 2014. ^ a b c Jørgensen, Lise Bender; Jesch, Judith (2002). "Rural Economy: Ecology, Hunting, Pastoralism, Agricultural and Nutritional Aspects". The Scandinavians – from the Vendel Period to the Tenth Century. Center for Interdisciplinary Research on Social Stress. pp. 131–37. ISBN 9780851158679. ^ Derry (2012). A History of Scandinavia: Norway, Sweden, Denmark, Finland, Iceland, p. 16. ^ Ann-Sofie Nielsen Gremaud, ‘The Vikings are coming! A modern Icelandic self-image in the light of the economic crisis’, NORDEUROPAforum 20 (2010), pp. 87–106. ^ Katla Kjartansdóttir, ‘The new Viking wave: Cultural heritage and capitalism’, Iceland and images of the North, ed. Sumarliði R. Ísleifsson (Québec, 2011), pp. 461–80. ^ Kristinn Schram, ‘Banking on borealism: Eating, smelling, and performing the North’, Iceland and images of the North, ed. Sumarliði R. Ísleifsson (Québec, 2011), pp. 305–27. ^ Frank, Roberta (2000). International Scandinavian and Medieval Studies in Memory of Gerd Wolfgang Weber. Ed. Parnaso. p. 487. ISBN 978-88-86474-28-3. ^ Did Vikings really wear horns on their helmets?, The Straight Dope, 7 December 2004. Retrieved 14 November 2007. ^ "Did Vikings wear horned helmets?". The Economist. www.economist.com. Retrieved 10 April 2014. ^ "The Gjermundbu Find – The Chieftain Warrior". Retrieved 10 April 2014. ^ Williams, G. (2001) How do we know about the Vikings? BBC.co.uk. Retrieved 14 November 2007. ^ By Magnús Óláfsson, in Ole Worm, Runar seu Danica Litteratura antiquissima, vulgo Gothica dicta (Copenhagen 1636). ^ E. W. Gordon, An Introduction to Old Norse (2nd edition, Oxford 1962) pp. lxix–lxx. ^ Lappalainen T; Laitinen V; Salmela E; et al. (May 2008). "Migration Waves to the Baltic Sea Region". Annals of Human Genetics. 72 (Pt 3): 337–48. doi:10.1111/j.1469-1809.2007.00429.x. PMID 18294359. ^ Helgason, A.; Hickey, E.; Goodacre, S.; Bosnes, V.; Stefánsson, K. R.; Ward, R.; Sykes, B. (2001). "MtDNA and the Islands of the North Atlantic: Estimating the Proportions of Norse and Gaelic Ancestry". The American Journal of Human Genetics. 68 (3): 723–37. doi:10.1086/318785. PMC 1274484. PMID 11179019. ^ Bowden, G. R.; Balaresque, P.; King, T. E.; Hansen, Z.; Lee, A. C.; Pergl-Wilson, G.; Hurley, E.; Roberts, S. J.; Waite, P.; Jesch, J.; Jones, A. L.; Thomas, M. G.; Harding, S. E.; Jobling, M. A. (20 November 2007). "Excavating Past Population Structures by Surname-Based Sampling; The Genetic Legacy of the Vikings in Northwest England, Georgina R. Bowden, Molecular Biology and Evolution, 20 November 2007". Molecular Biology and Evolution. 25 (2): 301–309. doi:10.1093/molbev/msm255. PMC 2628767. PMID 18032405. Retrieved 21 May 2012. ^ "A Y Chromosome Census of the British Isles, Capelli, Current Biology, Vol. 13, May 27, 2003" (PDF). Archived from the original (PDF) on 1 September 2012. Retrieved 21 May 2012. ^ "DNA shows Celtic hero Somerled's Viking roots". Scotsman. 26 April 2005. Brink, Stefan (2008). "Who were the Vikings?". In Brink, Stefan; Price, Neil (eds.). The Viking World. Routledge. pp. 4–10. ISBN 978-0415692625. Brookes, Ian (2004). Chambers concise dictionary. Allied Publishers. ISBN 9788186062364. D'Amato, Raffaele (2010). The Varangian Guard 988–453. Osprey Publishing. ISBN 978-1-84908-179-5. Derry, T.K. (2012). A History of Scandinavia: Norway, Sweden, Denmark, Finland, Iceland. London and Minneapolis: University of Minnesota Press. ISBN 978-0-81663-799-7. Educational Company of Ireland (10 October 2000). Irish-English/English-Irish Easy Reference Dictionary. Roberts Rinehart. ISBN 978-1-4616-6031-6. Fitzhugh, William W.; Ward, Elisabeth I. (2000). Vikings: The North Atlantic Saga; (an Exhibition at the National Museum of Natural History, Smithsonian Institution, Washington D.C., April 29, 2000 – September 5, 2000). Washington: Smithsonian Institution Press. ISBN 978-1560989707. Hall, Richard Andrew (2007). The World of the Vikings. Thames & Hudson. ISBN 978-0500051443. Hall, Richard (January 1990). Viking Age Archaeology in Britain and Ireland. Shire. ISBN 978-0747800637. Lindqvist, Thomas (4 September 2003). "Early Political Organisation: (a) An Introductory Survey". In Helle, Knut (ed.). The Cambridge History of Scandinavia: Prehistory to 1520. Cambridge University Press. pp. 160–67. ISBN 978-0521472999. Roesdahl, Else (1998). The Vikings. Penguin Books. ISBN 978-0140252828. Sawyer, Peter Hayes (1 February 1972). Age of the Vikings. Palgrave Macmillan. ISBN 978-0312013653. Sawyer, Peter, ed. (1997). The Oxford Illustrated History of the Vikings. Oxford, UK: Oxford University Press. ISBN 978-0-19-820526-5. Williams, Gareth (2007). "Kingship, Christianity and coinage: monetary and political perspectives on silver economy in the Viking Age". In Graham-Campbell, James; Williams, Gareth (eds.). Silver Economy in the Viking Age. Left Coast Press. pp. 177–214. ISBN 978-1598742220. Wolf, Kirsten (1 January 2004). Daily Life of the Vikings. Greenwood Publishing Group. ISBN 978-0-313-32269-3. Askeberg, Fritz (1944). Norden och kontinenten i gammal tid: studier i forngermansk kulturhistoria. Almqvist & Wiksells boktr. Downham, Clare (2007). Viking kings of Britain and Ireland: the dynasty of ́Ívarr to A.D. 1014. Dunedin Academic Press. ISBN 978-1903765890. Hadley, Dawn (2006). The Vikings in England: Settlement, Society and Culture. Manchester University Press. ISBN 978-0719059827. Heide, Eldar (2005). "Víking – 'rower shifting'? An etymological contribution" (PDF). Arkiv för nordisk filologi. 120. C.W.K. Gleerup. pp. 41–54. Heide, Eldar (2008). "Viking, week, and Widsith. A reply to Harald Bjorvand" (PDF). Arkiv för nordisk filologi. 123. C.W.K. Gleerup. pp. 23–28. Archived from the original (PDF) on 2008. Hodges, Richard (2006). Goodbye to the Vikings: Re-Reading Early Medieval Archaeology. Gerald Duckworth & Company Limited. ISBN 978-0715634295. Svanberg, Fredrik (2003). Decolonizing the Viking Age. Almqvist & Wiksell International. ISBN 978-9122020066. Wamers, Egon (1985). Insularer Metallschmuck in wikingerzeitlichen Gräbern Nordeuropas. Untersuchungen zur skandinavischen Westexpansion. Neumünster: Karl Wachholtz. ISBN 978-3529011566. Wamers, Egon (1998). "Insular Finds in Viking Age Scandinavia and the State Formation of Norway". In Clarke, H.B. ; Mhaonaigh, M. Ní; Floinn, R. Ó. (eds.). Ireland and Scandinavia in the Early Viking Age. Dublin: Four Courts Press. pp. 37–72. ISBN 978-1851822355. Wawn, M.A. (2000). The Vikings and the Victorians: Inventing the Old North in Nineteenth Century Britain. Woodbridge: Boydell and Brewer. ISBN 978-0859916448. Look up Viking in Wiktionary, the free dictionary. Wikimedia Commons has media related to Viking Age. Wikivoyage has a travel guide for Vikings and the Old Norse.